UPDATE: The Summer 2010 Concordia Journal was mailed out on Wednesday, August 18. The Summer 2010 Concordia Journal is at the press as we speak. So, it should hit our subscribers’ hands within two weeks. In the meantime, you can find the Homiletical Helps here at ConcordiaTheology.org. Day 80. As I write this, it is approaching three months since the oil well beneath the oil rig Deepwater Horizon began pouring tens of thousands of barrels of oil into the Gulf of Mexico—each and every day. Outrage over the spill and the failure to stop it has not been limited to environmental activists. Nearly everyone along the political spectrum, from conservatives to liberals, have expressed anger and outrage. Livelihoods that depend upon summer fishing along the gulf coast now teeter on the brink of disappearing. Countless birds and marine life have been harmed and killed. The oil has further contaminated marshlands and wetlands that many other animals depend upon for nesting and feeding habitats. The environmental and economic impact of the oil spill has been nothing less than catastrophic. Throughout it all, blame has been cast first in one direction and then another. BP has been unable to stop the leak and carry out effective containment operations. The federal government was slow to react and at times seems to have been mired in paralysis due to the bureaucracy of over a dozen agencies working at cross purposes. The entire disaster has made one thing quite clear. There are limits to what human beings know and can do. Everyone is fixated on “technical” solutions to stop the oil leak. And that’s understandable. It has to be stopped. Others are looking ahead to increased regulations for the oil industry or to the political proposals for alternate energy. Yet in the end, disasters like the gulf oil spill raise questions about how we live within creation and how we impact creation. This issue of the Concordia Journal would like to begin a conversation regarding some of the most basic questions of environmental ethics, questions that are ultimately answered theologically. The questions are simple yet the answers carry far-reaching ramifications. How do we see the creation in which we live? How do we see ourselves and our place within creation? How do we balance human needs with the needs of our fellow nonhuman creatures? For that, we need to also explore how do we “together with all creatures” fit within the story of God’s love for creation and his determination to renew it along with us…. You can look forward to the rest of the issue to explore some of the answers to these questions. To subscribe to Concordia Journal or to obtain individual issues, contact the Journal office at cj@csl.edu or 314-505-7117. Annual subscription rates are $15.00 USA, $20.00 Canada, $25.00 overseas. 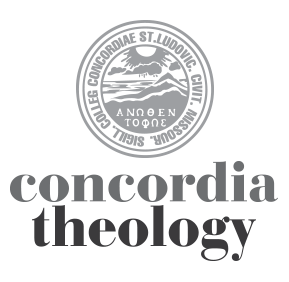 Concordia Journal is published quarterly by the faculty of Concordia Seminary, St. Louis.